This past season was a good season for fruits, including medlar. 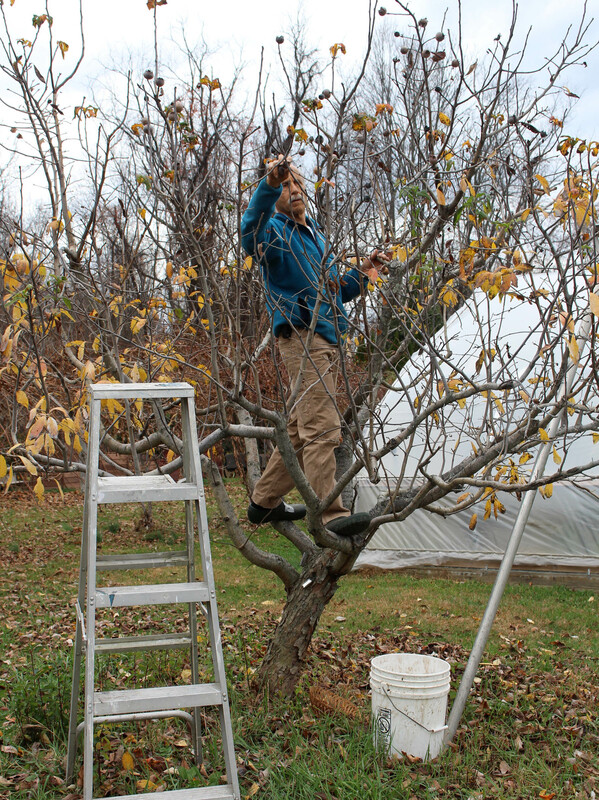 Yesterday, I harvested the crop from the leafless tree. But no, I couldn’t yet sink my teeth into one. Besides its odd appearance, medlar has one more quirk: The fruit needs to be bletted before being eaten. During the bletting process, at cool room temperatures for a couple of weeks, the white, rock-hard interior of the fruit turns to brown mush. A delectable brown mush, much like a very rich applesauce with wine-y overtones. I like the fruit and look forward to drawing out the season by refrigerating portions to delay bletting. 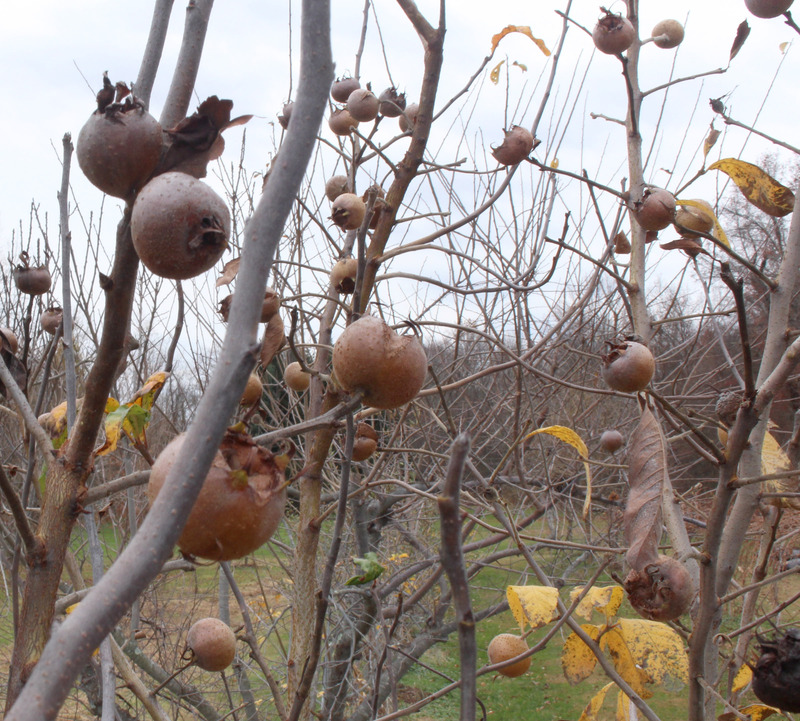 Whether or not the fruit is considered ugly and uncouth, the medlar plant has much to recommend it. It’s the perfect multi-use tree for a small yard. Where space is limited, no need to choose between whether to plant an ornamental or a fruit tree, because medlar is both. The elbowed contortions of the branches, more evident now that the plant has dropped its leaves, lend an air of rusticity. Come spring, white blossoms, each a couple of inches across and every bit as showy as a wild rose, unfold after the plant has pushed out a few inches of growth. A whorl of dark green leaves behind each flower contrasts and frames the blossom. Each of those blossoms will generally morph into a fruit. No additional tree is needed for pollination — another plus for small yards. And this is a small tree, so fits well into a small yard. My tree, in rich soil and over ten years old, is only about eight feet high and wide. (For more on the history, cultivation, and varieties of medlar, see the chapter on this fruit in my book Uncommon Fruits for Every Garden). As I walked back to my medlar tree, harvest basket in hand, other fruit plants, my blueberry bushes, caught my attention, these solely for their beauty. Blueberries offer some kind of “eye candy” in every season, with sprays of urn-shaped, white flowers in spring and slightly bluish, green leaves that look spry all season long. Autumn is blueberry’s showiest season, when the leaves usually come alive with a crimson color that rivals that of burning bush, a shrub grown solely for its autumn show. This month, the blueberry bushes look finer than they ever have, with some of each bush sporting golden yellow leaves, some orange leaves, and some crimson leaves. I’m going to attribute this year’s blueberry spectacular to the weather. Leaves’ crimson color is due to anthocyanins, which need sugars to develop. Warm, sunny days foster photosynthesis and sugar production but the relatively warm night’s of this season burn up those sugars. Carotenoids are responsible for the oranges and yellows of leaves. They’re always present, and my theory is that, with warm nights, less anthocyanin was present to mask them. Even after leaf drop, blueberries have something to offer, visually, when cold weather turns the stems red (perhaps less this year because of less anthocyanins?). This winter, I’ll enjoy whatever the plants have to offer, along with last season’s berries, now in the freezer. This entry was posted in Design, Fruit and tagged blueberry, medlar, Mespilus germanica. Bookmark the permalink. Trackbacks are closed, but you can post a comment. I enjoy your posts no matter where I am Maine or Italy. I need to study this medlar fruit a little more … you had me at the ideal fruit to pair with wine! I am thinking spread on rustic toast with some vegan nut cheese and of course, a nice wine. Only 8′? I may be able to find some room. Also, I imagine, folded in with whipped cream. And I harvested 51 little medlars from my tree this fall, Lee. We are still consuming them. You are right; it was a fantastic year for fruit. I got a record (for me) 7 colanders of northern kiwi from one vine. Very popular in the Balkans too. It was the favorite fruit of my childhood in late fall. I lived in the city and there were tons of them at the farmers’ markets. Cultivars do matter and some are much tastier than others. I’m absolutely surprised that it’s virtually unknown in North America.